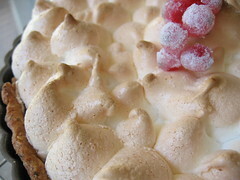 Redcurrant Meringue Pie - Do You Know The Muffin Man? Notes: The crust is made with ground hazelnuts and was very easy to roll out between plastic wrap, although it was very thin. 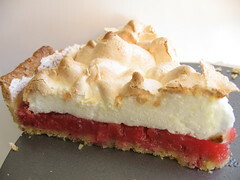 It's unbaked when the filling goes in, so it comes it soft and tender. I hadn't used redcurrants before and found the raw fruit to be very acidic, so I only used about 200g in the filling instead of the full 250g. It goes in Pepto-Bismol pink and comes out darker, like blood-orange. As it uses cornstarch, the texture is a bit pasty. Flavour-wise, it's a bit like cranberry (without the tannins). Good comments from all the tasters at the potluck I went to.